INNSBRUCK, AUSTRIA: Surrounded by the beautiful Alps and its snow-capped peaks, Innsbruck is a place to be at any time of the year. It’s a paradise for winter sports lovers for being surrounded by gorgeous mountain ranges. The city is known for alpine sports opportunities, especially in winter. Winter attracts more people in Innsbruck from all around Europe and the world. It hosted couple Winter Olympics before and winter sports are part of this city’s culture and pride. For us, we had only few hours here and we stayed mainly in the old town which is an absolute charmer. 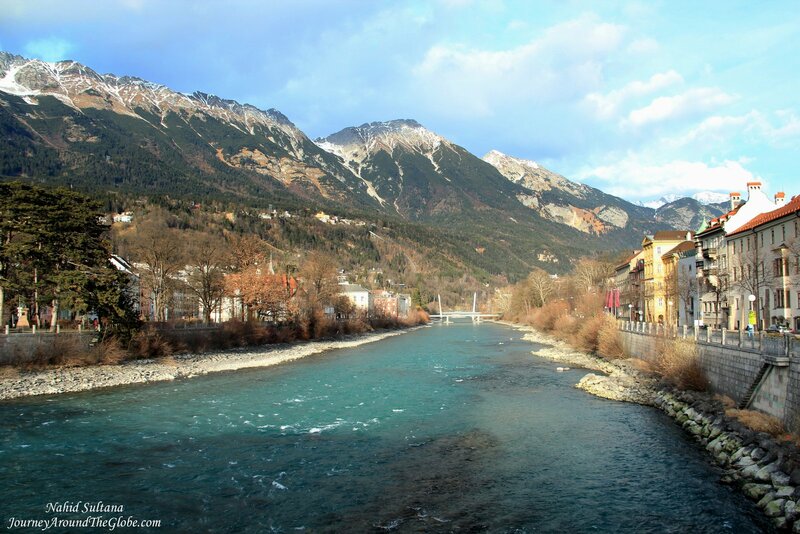 There are tons of things to do in Innsbruck, especially for energetic athletes. Other than many historic landmarks, middle age buildings in old town, and lively city life, it has the largest ski resort in the Alps. There is a parking structure very close to the old town where we parked our car. Old town can be covered on foot and you see a lot more doing it that way. If you don’t speak German like me, its ok, all the shops, restaurants, and tourist spots usually have people who speak very good English. 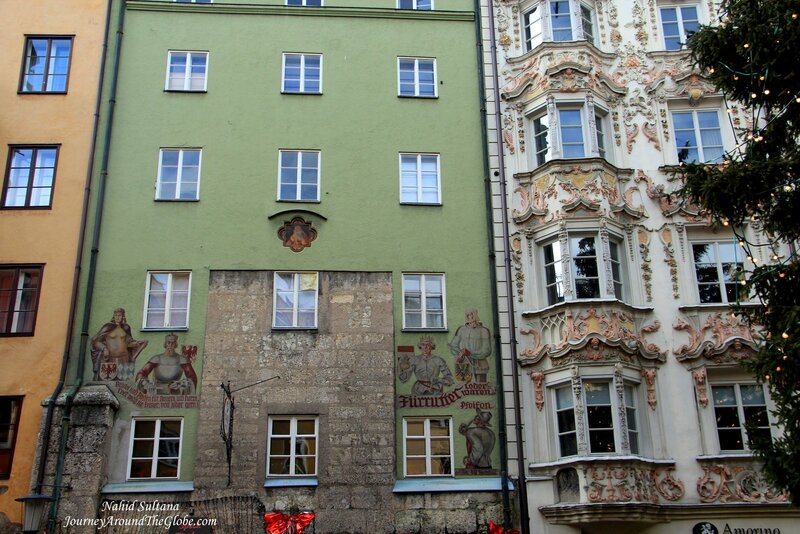 TIME of TRAVEL: Innsbruck was the second stop in our winter road trip 2013. We started our journey at the beginning of Christmas break. After visiting two famous castles in Fussen, Germany (first stop of this trip) we crossed into Austrian border the same night, stayed in Mieming (a small Austrian town very close to Innsbruck), and drove to Innsbruck next day for few hours before our next destination to Salzburg. OUR HOTEL: We stayed about little less than an hour drive from Innsbruck in a tiny town called Mieming. Hotel’s name was Pension Café Seelos. The setting of this accommodation was like right out of a romantic book. Surrounded by the mountains, this homely place is in the middle of a quiet town away from any chaotic environment. It had free breakfast, parking and Wi-Fi with few restaurants within walking distance. We were traveling with my uncle-in-law in this trip. He fell in love with this town and hotel instantly and mentioned few times how he wished he could stay there little longer just to wake up close to the mountains and read books leisurely. 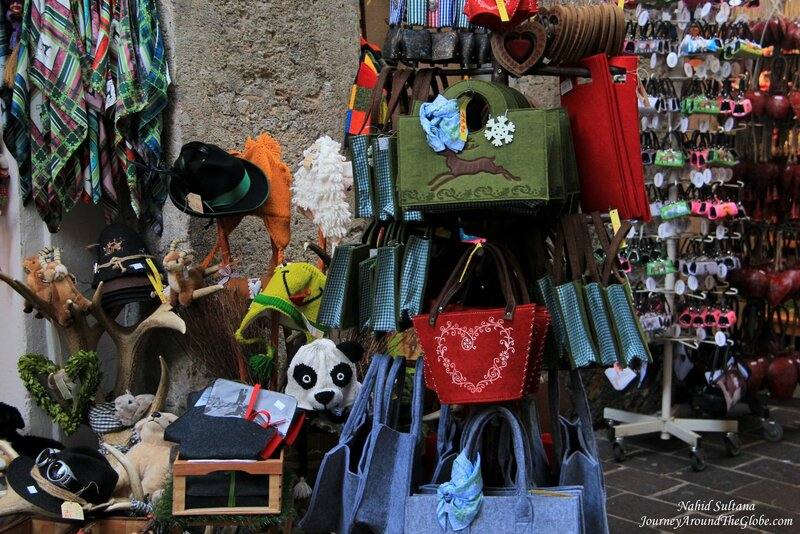 EATING and SHOPPING: There are plenty of restaurants and cafés in the old town of Innsbruck. We finished our lunch in Nord See, which is, I think, a German sea-food chain. It’s more like a fast-food type place with much better options and tastier food. We had some hot dishes but there were many take-away options too, like sandwiches and etc. Austrian or Tyrolean hats are pretty famous and unique here. They are very elegant looking, sometimes decorated with feathers or ribbons or ropes. Most of the souvenir shops have these hats along with regular t-shirts, key-rings, and other stuff. We saw many unique Christmas decors during our visit. Winter cloth accessories (like woolen gloves and scarfs), Bavarian mugs, cuckoo clocks are some things you can find in the shops here too. PLACES WE’VE VISITED: We stopped at Innsbruck on our way to Salzburg and spent few hours just touching only the highlights of this city. 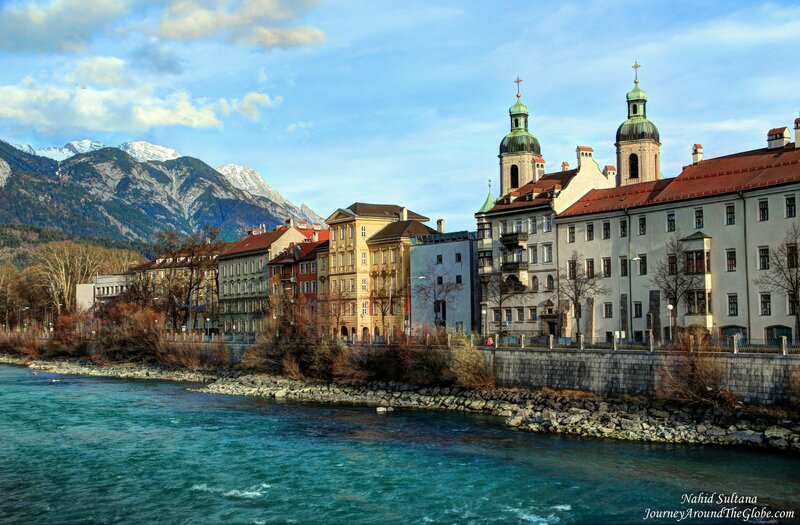 Innsbruck has bunch of museums, a zoo, and many historic landmarks within the city limit. If you are more of a nature-lover or like winter sports then you can drive up to the mountains and find some ski resorts. There is also a castle, Schloss Ambras short distance from the city…we haven’t been there but may be worth a visit if you have time. 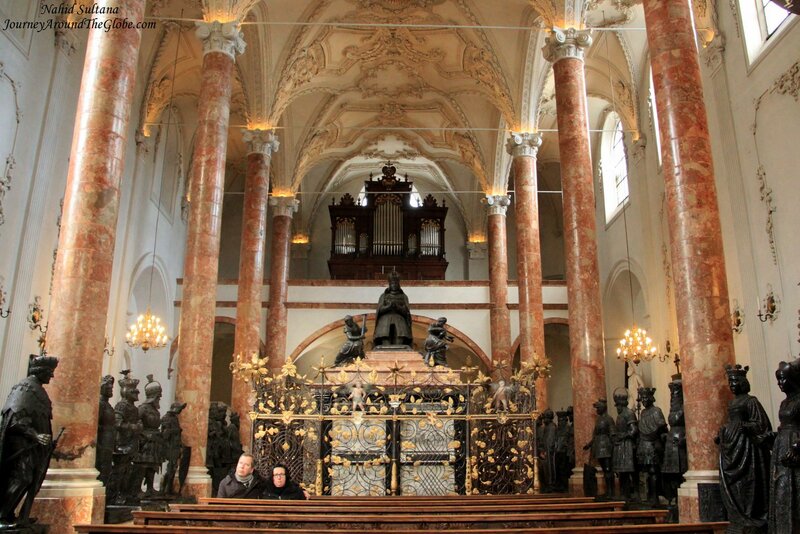 1) JESUITKIRCHE (JESUIT CHURCH or UNIVERSITY CHURCH): This was our first stop although wasn’t in the list. The church was erected between 1627 – 1646 with the support of sovereign of Tyrol, Archduke Leopold V, and his wife, Archduchess Claudia de Medici, both of who are buried in the crypt here. It was severely damaged during WWII and looked like a ruin. Much of the interior decoration was lost forever. In 1953 it was newly constructed. Its high dome and white ceiling with detail design are worth seeing. 2) HOFKIRCHE: The Innsbruck Hofkirche with the tomb of Emperor Maximilian I is the most important monument in the Tyrol region and the most splendid of all imperial tombs in Europe. It is a product of European courtly art from far more than the German-speaking areas, for which Maximilian I employed the best artists of the period. King Maximilian I’s decorative tomb is enclosed by some real-size bronze statues that show members of different dynasties. It is a gorgeous church with grand interior and a must-see in Innsbruck. Although we didn’t go to Tyrolean Museum of Popular Art, it is in the same building with Hofkirche. It houses the biggest and most significant cultural heritage collection in Tyrol and offers an insight into the diversity of the arts and crafts from “Land in the Mountains”. It’s open from Monday to Saturday from 9 to 5 pm and Sundays and holidays from 12:30 to 5 pm. There is a fee to enter the church, but we were there on Christmas Eve and it was free that day. 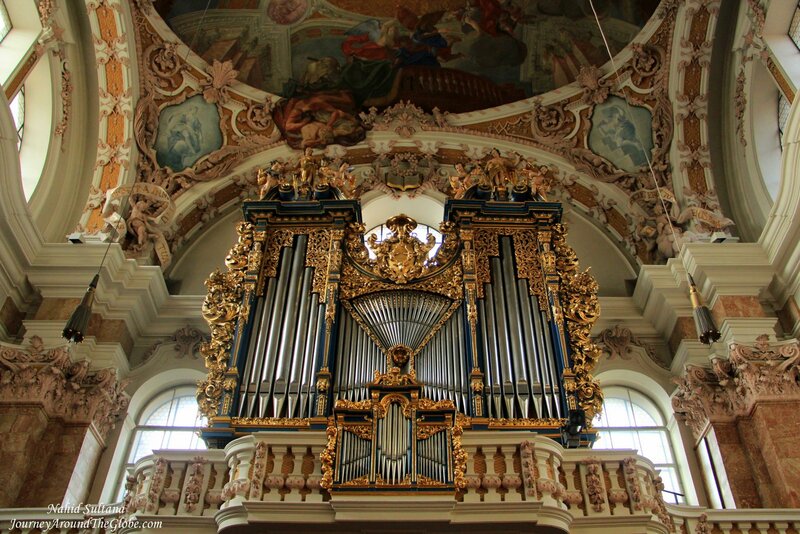 3) ST. JACOB CATHEDRAL: This is probably the most beautiful church/cathedral in Innsbruck. Few minutes’ walk from Hofkirche, St. Jacob Cathedral is a Baroque style architecture that deserves attention. Its gorgeous ceiling, fancy vaulted dome, ornate high altar, dazzling organ, frescoes, and pulpit make this cathedral one of the most exemplary works of Baroque interior in whole of Austria. 4) HERZOG-FRIEDRICH-STRASSE and GOLDEN ROOF (GOLDENES DACHL):Herzog-Friedrich-Strasse was the old town’s main street once, now a pedestrian zone. Some artistic old buildings decorate both sides of this cobbled-stone street. At one end of Herzog-Friedrich-Strasse, is the Golden Roof. 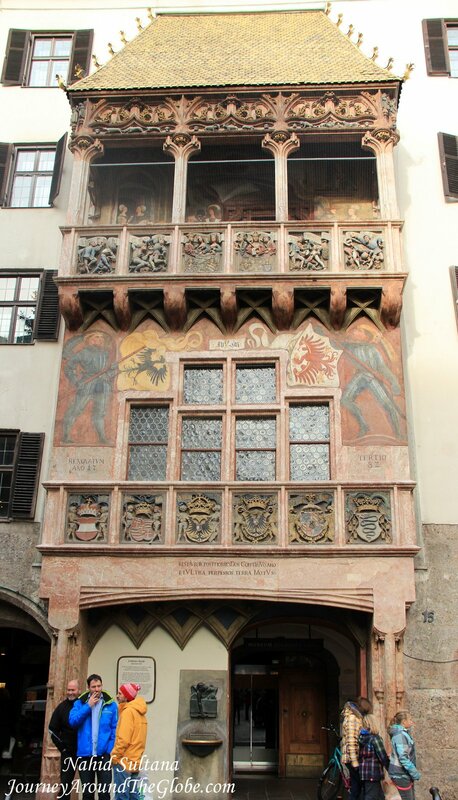 It is a historic building from 1420 and was built on behalf of King Maximilian I. It has a beautiful façade with 2657 fire-gilded copper tiles. There is a museum if you want to go inside, we just saw it from outside and loved its marvelous façade. 5) MARIA-THERESIEN-STRASSE and ST. ANNA’S COLUMN: Across the street from Herzog-Friedrich-Strasse, is Maria-Theresien-Strasse. 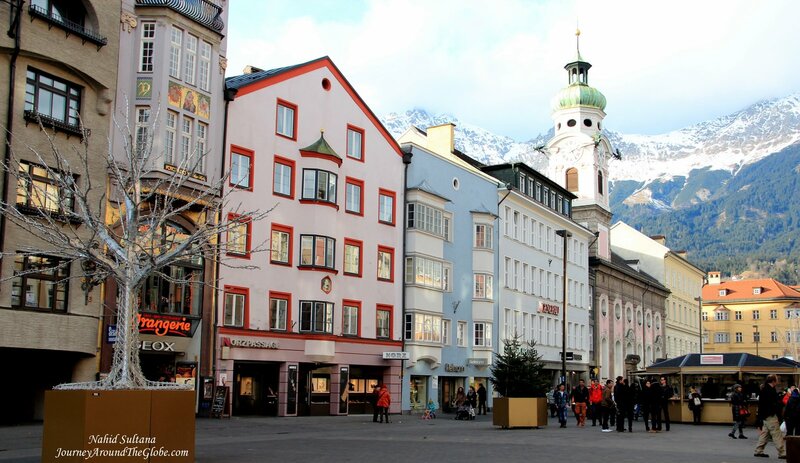 This is the central pedestrian area and a picturesque boulevard of Innsbruck. What makes this street beautiful is the prominent mountains range in the backdrop and its historic colorful buildings. There was a Christmas market here when we visited. Many shops and restaurants make this place a perfect gathering point for the locals and the tourists. In the middle of this street stands St. Anna’s Column. It was built in 1706 using Tyrolean marble. I loved this part of Innsbruck where hustling city collides with the beauty of Alpine nature…it is an absolutely breathtaking spot. 6) RIVER INN and INN BRUCKE: There is a bridge, Innbrucke, over River Inn few steps away from Zerhog-Friedrich-Strasse from which the city adopted its name. There isn’t much to do here except for enjoying the stunning view of River Inn, the mountains, a flourishing city, and colorful buildings by the river. We crossed the bridge, Innbrucke (it’s for both pedestrians and cars) and came back to old town within few minutes. It is a lovely sight and shouldn’t be missed. It’s a slice of Tyrol’s natural beauty within the city. Hi, we are also planning a half day visit on 11th May this year to Innsbruck 9 am to 3 pm and want to know what all can be covered. We have kids with us and will be driving into the city and after parking the car (pls advice where to park) want to walk through, do you suggest taking a 24 hour public pass, also we want to go to top of the mountain to have a good city view. We are not inclined much towards museums, or churches except the no to be missed ones (we will cover many such places in other city) and like natural beauty more. 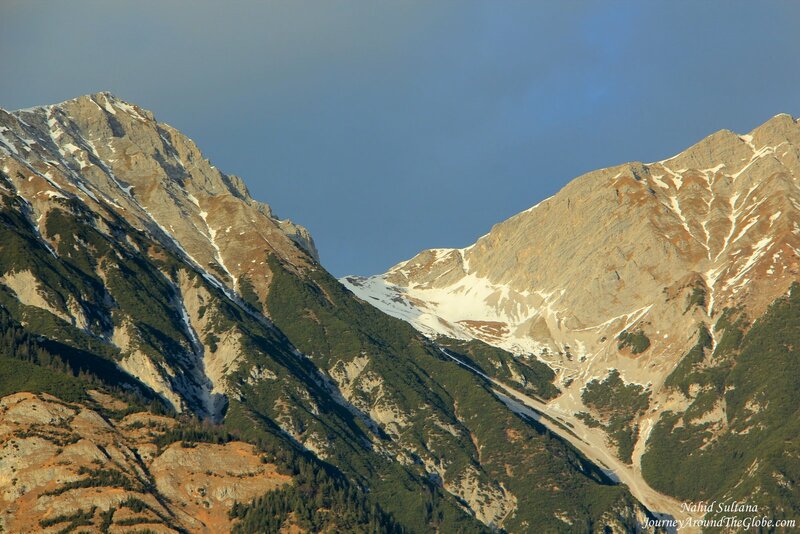 Hi Saurabh, thanks for stopping by and WOW for going to Innsbruck. For parking, we parked in a paid garage and it was within walking distance. We didn’t get any public pass, since we just stayed in the main city center and didn’t really go to any museums or took any public transportation. We didn’t go to the mountains in Innsbruck either. You can see the mountains from the city and I’m not too sure about how to go on top of those mountains or how long it would take. Good luck on your trip and enjoy. 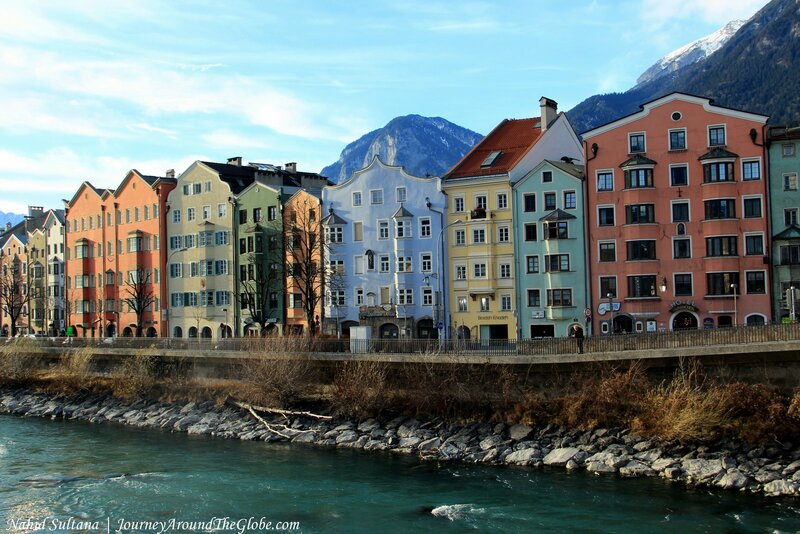 From your perspective and beautiful pictures, Innsbruck worths definitely a visit! Thank you.